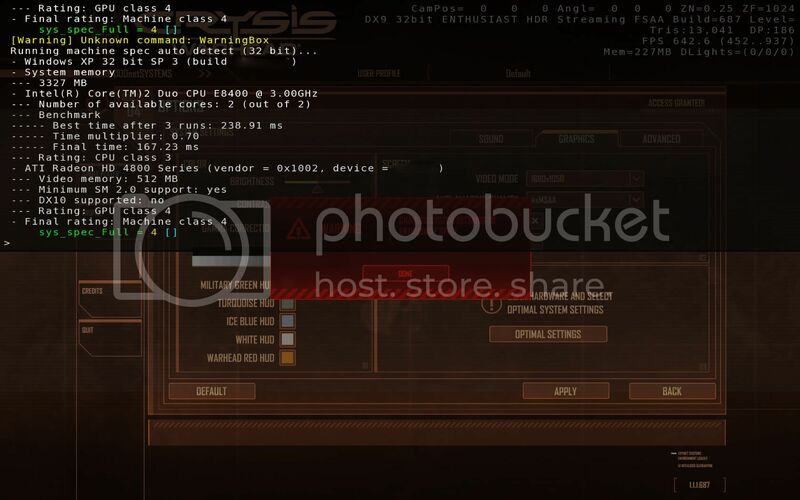 The purpose of this thread it so collect ideas on the best options available to us to get the best gaming experience when playing Crysis Warhead. 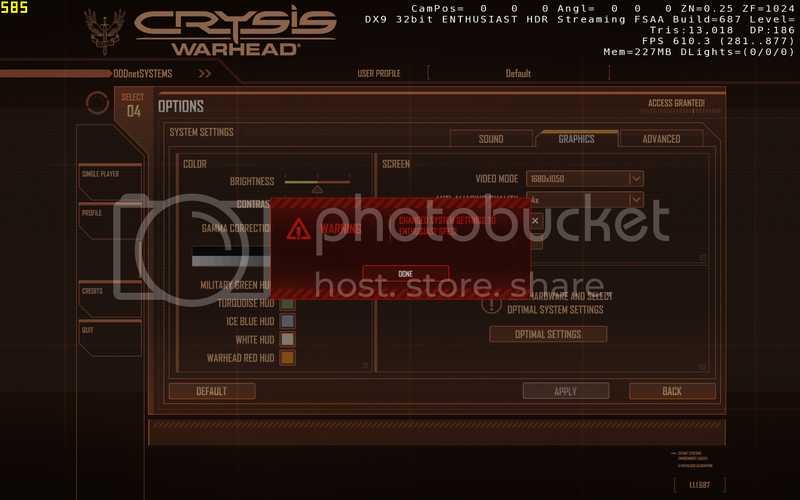 Keep in mind that the tweaks, ideas and other information provided in this thread should be usable in Crysis. I found a post that discuss how you can use CFAA instead of CSAA (which nivida uses). Note: Adding the 4870 profile has decreased frame rates for me. I am not sure why this is. then click on the optimize button. Select your resolution and level of AA and hit the apply button. If you don't see it you may have to exit and restart the game. Results should be a slight increase in performance but IMO (based on my PC setup) AA looks better. The end result should looks something like this. The source of the information can be found here if you require a reference (IE: not my idea). r_TexturesStreaming=2 is default setting. Some say changing this to 1 helps with the auto save crashing. e_precache_level = 1; level is loaded up beforehand or a potential drop in any in-level stuttering. r_Glow = 0; Removes the excessive glow on distant objects and can make things like flares and the illumination of light bulbs look a little dim. But the illumination of the surrounding area of the light bulb and flares are not effected (IE being able to see in bulidings, etc). e_view_dist_ratio_detail = 50; Enthusiast. Use to be 30 in Crysis in Very High. This controls max. view of distance for objects. e_view_dist_ratio_vegetation = 65; Enthusiast. Use to be 45 in Crysis in Very High. This controls max. view distance of vegetation and foliage. r_TexturesStreaming = 0,1,2. 1 or 2 use constant texture streaming with 2 being more aggressive streaming. 0 means that textures are preloaded from cache which can cause crashes. etc. e_time_of_day [value]. This allows you to change the time of day in game. IE: 4:00pm or 5:00pm, etc. It's always a good idea to remove the cache files if you create or make changes to customization files. Next defrag the harddrive that these files are stored in (usually C:\drive). Then start Warhead. Make sure you defrag the harddrive after you delete those cache files. Once you defrag your hard drive then start Warhead with no (0) cache files you shouldn't have to defrag your HD after that. subdirectories. Depending on which map you use. If you record a demo in airfield the demo will be saved in the airfield subdirectory. If you record a demo in ambush then the demo you recorded will be saved in the ambush subdirectory, etc. How to play back? 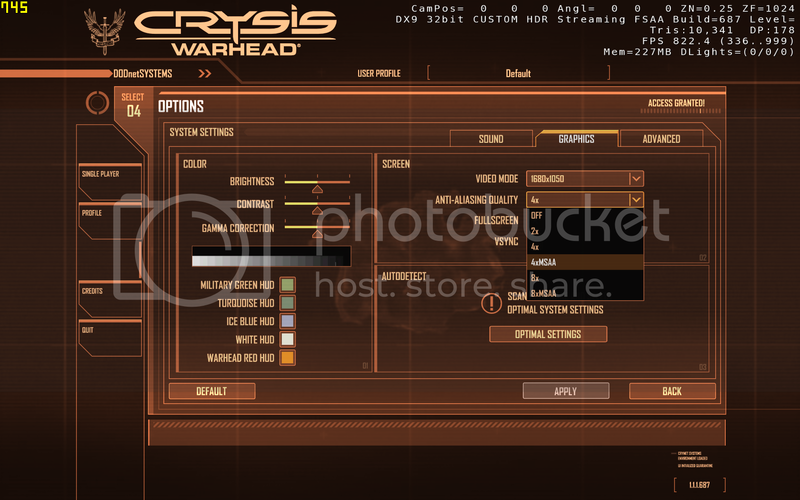 I found a post on how to create a benchmark for Crysis Warhead here. Unfortunately, there is no "play" command that will allow this. There is a benchmarking program similar to one used for Crysis. 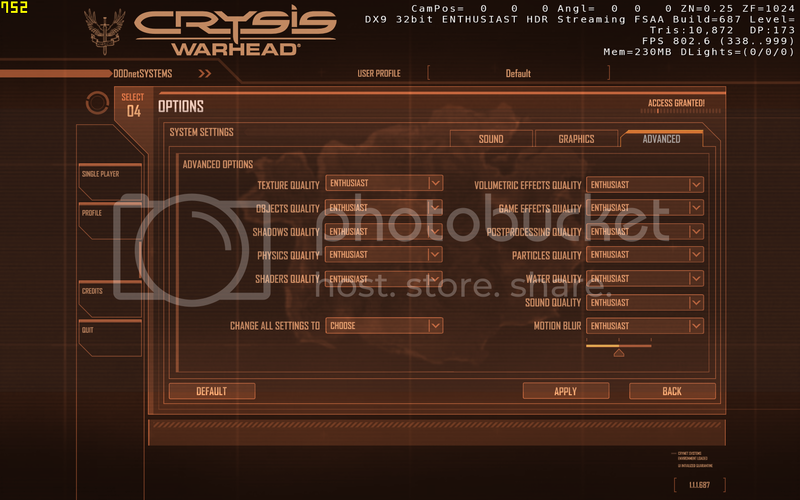 It's called FrameBuffer Crysis Warhead Benchmarking Tool. There has been a few updates and would not be surprise to see a few more. So far the only issue I've seen with Warhead was that it has a tendency to crash in one form or another. The reason for it is not clear but some believe it's the result of a memory leak. The game seems to crash most often during auto saves. I have a question. In CCC it lists the HD4870 as 0x9440, but it lists the HD4850 as 0x9460. Is 0x9442 correct for the 4850? Where do you find the correct information for it? Hmmm... Everywhere I look it's listed as 0x9442 except in CCC on my machine. I guess I'll stick with 0x9442 as it seems to be the common consensus. *I would be interested to see what CCC says for other people's 4850's. I believe the numbers may change based on brand. So after I create the .bat file and put in the game directory I start the game and it's good to go? Here's a config I found which will allow decent framerates and high quality in conjunction with slower hardware, i.e. anything less than an 8800GT. I tried the "Uber" quality config and got 15FPS lol so I'm personally gonna wait till Jrob or someone releases a decent ultra quality config for it. Great work man ! 30-50fps enthusiast 1440x900 and no noticeable differences in IQ! I'm gald its working out for you! What FPS were you getting before? If it were socially acceptable EastCoasthandle I would give you a kiss. Awesome job man! Maybe Ill be able to run this damn thing now. no benchs!, machine use for gaming only! and replace all the data inside for this data? i have to copy exactly (copy-paste) this info and replace/erase all data inside? Based on a few correction what you do next is start the game go back to options, graphic tab then hit the optimization button. Once you do that look at your AA options. You should have an AA option of 4x and 4xMSAA. Choose 4xMSAA. The performance difference between the 2 are minimal but with MSAA it will work. It's odd they didn't use any AA in their review. But thanks none the less for sharing. I'd like to see Crytek get off Nvidia's payroll so we can see what a real card actually does here. It's a sad state of affairs indeed... Illeagal mabye? It's kind of like a car company making friends with OPEC and creating a formula of gasoline that only works well with their cars while everyone with different brands of cars suffer. I really don't find much credit with this review. If you look here the author believes that Warhead needs to run at 45+ in order for it to be smooth. We already know that's not true. The difference between X2 and 4870 is 2 FPS. They didn't try to use AFR-FriendlyD3D.exe in place of the Crysis.exe to see if X2 performance improved. Also, there was no AA or AF used in any of the results. And, I get around 22-25 FPS with 4xAA @ 1680x1050. And, I get around 22-25 FPS with 4xAA @ 1680x1050. Now at 1680x1050 I am averaging around 33 FPS without AA. Which is a far cry of 22 they have . This is at stock with no modifications. They didn't try to use AFR-FriendlyD3D.exe in place of the Crysis.exe to see if X2 performance improved.